Ashna has been a water baby since she was four and a half years old, which is why it didn’t take her too much time to love swimming. We got her involved in a couple of activities like dancing, drawing and finally swimming. She started swimming in all seasons for 4 days and for 2 hours straight. Her breakthrough came in and she realized her love for swimming when we enrolled her in Rupali Repale’s Swimming Academy. Joining this academy has been the best decision ever as she has tasted sweet success in the form of achievements and acknowledgments. While she won her first ever Gold medal in the freestyle category, she also won a Gold medal for her Backstroke style under the 6 years category at the Palaso event in 2018. Keeping her winning streak alive, Ashna has procured a Silver medal in Dualthon under the 6 years category at Palava in 2018. She has participated in the 9th State Level Open Sea Swimming Competition at Malvan organized by Sindhudurg Aquatic Association and covered 500 meters distance. 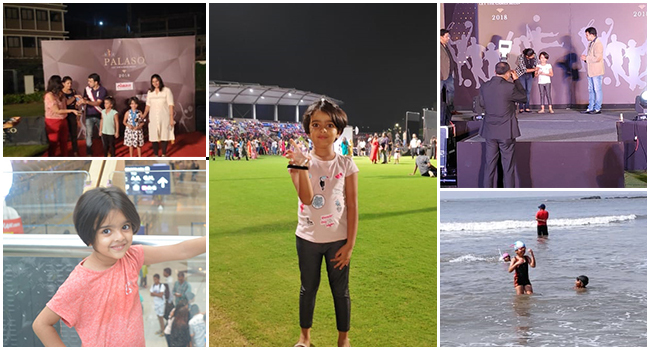 Irrespective of her age, she has participated in freestyle at District Level in the under six years category held at Nerul Gymkhana in 2018 and participated in freestyle and Backstroke in the under eight years old category at Vibgyor, Airoli. While she has acquired Bronze medals in Freestyle and Kicking at Speedo that was organized for kids under the six years category, she has also done sea swimming from Uran to Gateway of India and covered the distance of 1 km. Ashna has always been a wonder child for us even when she was awarded the ‘Eminent Girl’ at Palaso in 2018. #PalavaMakesMeMore joyful of all that Ashna has achieved at such a young age and makes me excited for her bright future.